JAIVANA CANNON…. something of which i had heard a lot but this time it was in front of me. Build in 1772 and considered as the biggest Cannon of its time. 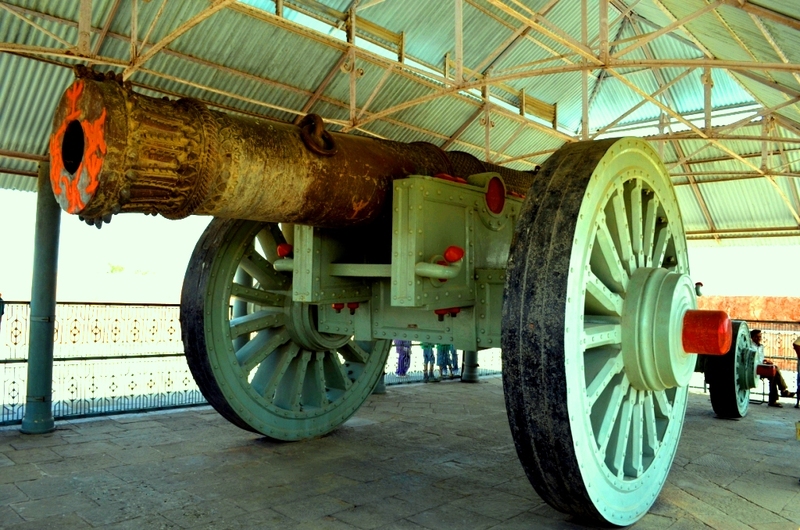 May be Maharaja Sawai Jaisingh II foresightedness made him to give orders to make such a huge cannon , having the range of 22 miles and needed 100 Kg of Gun powder for a single shot. It was the time of plunders and wars , every ruler was worried about threats from both outsiders and insiders , which made them to think different and keep themselves safe. Jaigarh fort was built to save Amber fort , and for the same reason Jaivana Cannon is Placed on top of the Jaigarh fort. May be its presence only made its impact and it was never being used except only once when it was tested. Standing from ages gaurding the city Jaivana Cannon is still considered as the Guard of the whole Jaipur city , and is worshipped by royal family on all important festivals. My journey of our most exotic and enthroling world, specially my motherland India, has inspired me to come up with the idea of My greedy backpack. My greedy backpack welcomes all who love to travel, photograph and would like to share their experiences in adventure. My greedy backpack would act as a single window for all those sitting at home, unable to venture into our dream like world , to have an insight to enjoy the overwhelming experiences and unforgettable moments encrypted on the heart of others.